Those of us who are new to the legal drinking age and of course, come from places other than Spain, often become super confused when we arrive at the bar to see a bunch of brands on-tap that we don’t recognize. Turns out, it’s not so terrifying to confidently order the beer that fits our mood, or goes better with certain types of tapas! Read along to become an expert, and then head to your nearest bar to test them out for yourself. The actual brand is important, for sure, but first there’s the whole issue of what size to order. And how to communicate that in Spanish! Look no further. We’ve got you covered! Caña – A little less than half a pint, this is the smallest size you can order. Generally they only cost around 1€, but of course this varies based on the quality and reputation of the bar! Jarra – A mug or a jar of beer, la jarra is perfect for parties and is the largest size most bars and restaurants will sell. It’s normally the cheapest and most practical way to drink if you’re all ordering the same thing. Botella de cerveza / tercio – usually 12 oz, standard size bottle beer. Smooth, light, Mahou Clásica appears in almost every bar and is most likely what you’re getting when you order a simple caña of cerveza on-tap. It has a shiny gold color and is made from malt, yeast, hops, and water to produce a classic taste. Pilsen beer made in 1969 from varieties of hops and yeast. With a 7.5% alcohol concentration and a potent malty flavor, this Lager Extra is Mahou’s newest creation, made from barley and double hops. Although bitter, you can taste caramel tones and smell the aroma of ripe fruit. This beer distinguishes itself from the rest, not only because of its appearance in a bright green bottle, but because it comes from Andalucía’s first ever brewery, the Cervezas Alhambra brewery. You can taste the hints of orange and caramel in this full-bodied beer. Brewed by Estrella Galicia, this brew is 6.5% alcohol and is of super high quality, although it is on the more bitter side. It comes from the city of La Coruña in the region of Galicia, and takes on a bright gold color and a refreshing hops flavor. 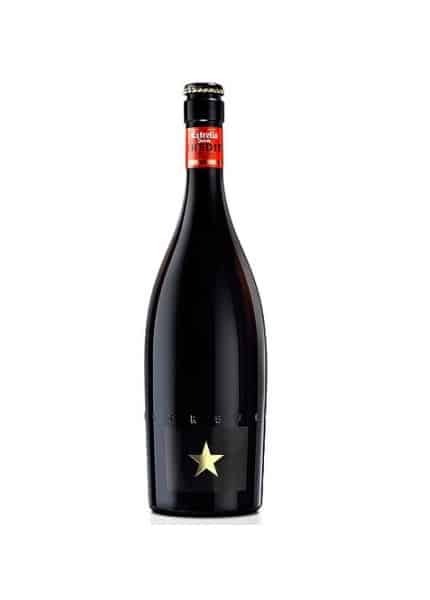 This brand-new brew which translates to “never done before” joined the market in 2008 thanks to its creators, Estrella Damm (estrella, meaning “star,” is another Pilsner Lager brewed in Barcelona and sponsored the Emirates Team New Zealand in 2007) and Ferran Adriá, who were determined to craft a beer that compliments the various flavors of typical Spanish cuisine. 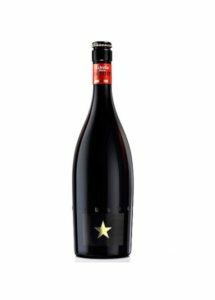 For that reason, the creamy yet potent Inedit goes great with fish and anything light such most tapas, starters and salads. Made from a combo of barley, malt, wheat, hops, coriander, liquorice and hints of fruity flavors such as orange skins, it is an intense, complex luxury beer you won’t want to miss out on during your time in Spain! Brewed in Zaragoza, this beer has low fermentation, and its balanced flavors and pleasant aftertaste make it super smooth and addicting! With a shiny, amber color, the beer won a tasting analysis according to a study made by the Organization of Consumers and Users (OCU) in early 2016! 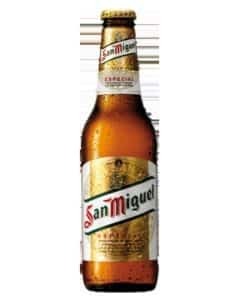 San Miguel is also a super popular brand with many variations such as the classic Pale Pilsen, San Miguel Blu (combines beer and vodka tastes), San Miguel 1516 (mild, bitter beer that appears golden yellow, got its name from the Law of Purity decreed by William IV of Bavaria in 1516, which declared that beer should only be made from malted barley, water, and hops), San Miguel Clara (lemon flavor and low alcohol content), as well as the new addition of the San Miguel Gluten-free. Ambar export is the perfect balance between sweet and bitter, with a creamy texture flavored slightly with dried flower and syrupy fruits. It has a high alcohol concentration and is made from barley and hops. Currently owned by Heineken International, Cruzcampo is the biggest beer producer in Spain. 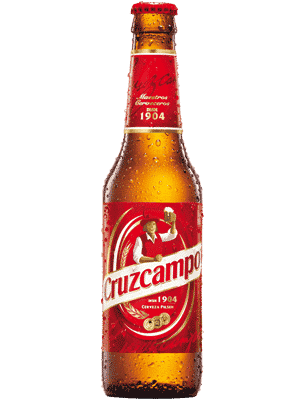 It was first created in Seville, its name translating to “the cross of the field.” Cruzcampo’s label features a smiling Gambrinus, also known by many folk legends as the icon and creator of beer. Cruzcampo is super popular in Andalucia, however there is a brewery right here in Madrid! Another fun fact is that Cruzcampo is the official sponsor of the Spanish national futbol team. 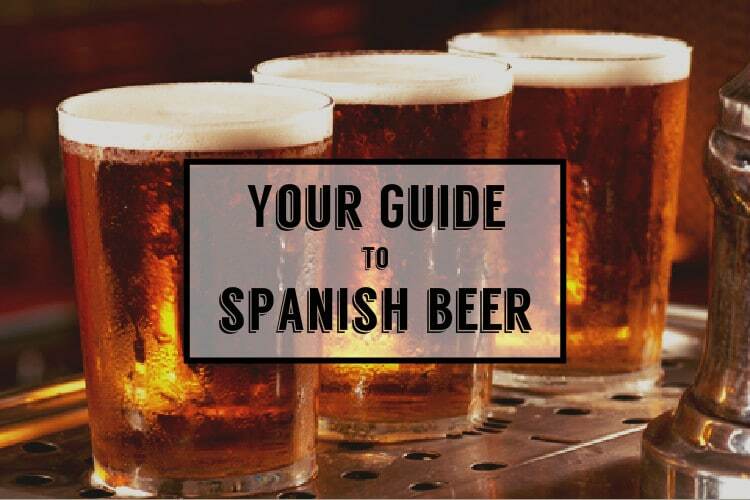 The most common types you’ll see are the basic Cruzcampo Pilsen, the Cruzcampo Gran Reserva, a strong lager that won the 2009 World Beer Awards, as well as the shady and non-alcoholic types. Also be sure to try the limited edition Cruzcampo Navidad, which is only available around this time once a year! 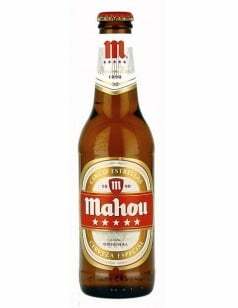 The only beer whose label is written fully in Catalan, this brand is brewed in Barcelona and has become super popular among the general Spanish population. The original brew, with the label simply reading Moritz, is a pale Pilsner Lager made from barley, Saaz hops, and the mineral water from the Font d’Or spring in Montseny. If a soft, pleasant beer, sounds nice, but a stronger Lager with a higher alcohol concentration (7.2% roughly) sounds even better, look out for the Extra Premium Lager known as Moritz Epidor. Under 18 or just want to enjoy the refreshing taste of Moritz? Try the alcohol-free version Aigua de Moritz. Great suggestion! We will add it to part 2! Brilliant article. The information I have been searching precisely. It helped me a lot, thanks. Keep coming with more such informative article.